The gardens at Burtown are unusual in that they are worked by three generations of the family; Wendy Walsh, one of Ireland's finest botanical artists; Wendy's daughter the painter Lesley Fennell, and her son James, a professional photographer. Both Wendy Walsh & Lesley Fennell have studios in situ that may be visited. 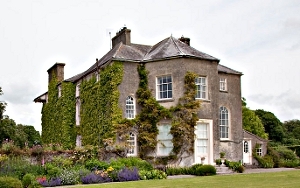 Burtown House and Gardens are available for small wedding parties and celebrations. Marquees can be set up in different areas of the garden, and lunches and birthday celebrations, anniversaries and corporate events are all catered for. Guests can make use of the fine 18th Century drawing and dining rooms and extensive gardens with activities such as Farm walks, Tennis and Croquet. Please note that Burtown House is not a guesthouse and therefore does not provide overnight accommodation. Just over one mile from the M9, it sits just below Mullaghmast Hill and Rath once part of the original estate, 45 minutes from Dublin, 25 minutes from Kilkenny, 50 minutes from Waterford, it is in easy reach from all directions. The historic Quaker Village of Ballytore is close by as is the historic trading town of Athy. There is much to see and do within our locality. We look forward to welcoming you.